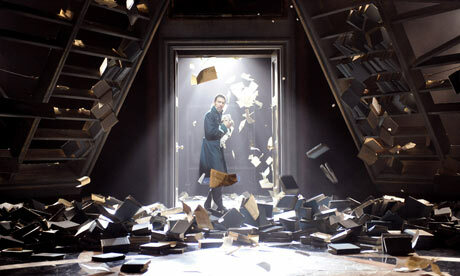 The Winter’s Tale by William Shakespeare, an RSC production at the Camden Roundhouse, London. Centuries before Sarah Kane demanded that giant sunflowers should burst out of the stage, Shakespeare wrote the now infamous stage direction “Exit, pursued by a bear.” As if this wasn’t a big enough challenge, the play as whole seems to suffer from a split personality. The first half is a full-scale tragedy, all royal rage, jealousy, imprisonment, disappearances and death. The second half features, among other things, death by bear, multiple disguises, and let’s not forget the statue that comes to life. Director David Farr’s strategy for dealing with this incongruity was not to fight it, but to embrace it, going full-throttle for the Serious Shouting and Moody Lighting at first, and then hitting us with rainbow-coloured costumes, crazy dances and caricatures after the interval. The benefit of this was that neither half had to be muted to fit an overall atmosphere; the problem was that I’m not sure the plot is quite tragic or quite comic enough to warrant the extreme interpretation. Without Jon Bausor’s masterful set design the production might have been at risk of simply cracking right down the middle. Taking his cue from the play’s title, Bausor used books and the pages of books as the cornerstone of the show: Two oversized bookshelves dominated the stage throughout the first act, crashing down when King Leontes learns of his wife’s death, allowing the books to fall in giant heaps on the ground. Torn pages form the 10 feet bear puppet. The tree at the centre of the set for Perdita’s wedding has pages where the leaves should be. This was the perfect imagery to run with for this strange and problematic play, placing it firmly in fairytale territory.